Had plans to follow GPU Gems to gain knowledge in Shaders - but my journey came to an abrupt end. Offsetting the vertices was no issue, but then I met partial derivatives to solve the normal for each vertex. Starting at equation 4a to equation 7. It does however not seem to display what I would describe as good normals for the wave surface. So obviously I'm doing something wrong. Ignoring the green channel here using the full code pasted below. Would expect the colors to blend more smoothly and uniformly. Seeing I only got one wave this far. What I am wondering is how to get the normals one would expect or if this is the expected result following the math (or rather what I could make of it) in GPU Gems. Note: I am attemping this in Unity, so I did adapt what I assumed to be Z-up to Y-up from the GPU Gem book. 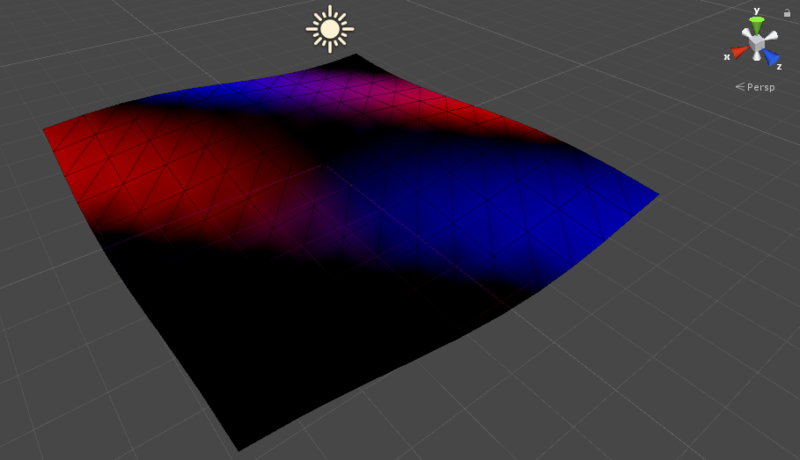 Your shader is a vertex shader, which means color values are calculated per vertex and linearly interpolated across the triangle, giving the non-uniform result you see. If your mesh had more triangles, those inconsistencies would decrease as more points are being calculated and the harsh transitions would be smaller. Alternatively, you could use a different shader type (eg surface shader), but as the underlying data for the slope is vertex based, you'd be taking assumptions that would end up giving the same result (but take longer to compute) or write code that non-linearly computes the slope across your surface-- no assumptions!--(which would take the longest to compute). Not the answer you're looking for? Browse other questions tagged unity shaders water cg shaderlab or ask your own question. Is the series of books “GPU Gems” still good for a modern OpenGL 3.0+ approach? Is normal mapping cpu overhead or gpu overhead? Custom Terrain Shader Normal Map Issue?